Limpato is a very less known but very tasty fruit from the humid tropics of South East Asia. 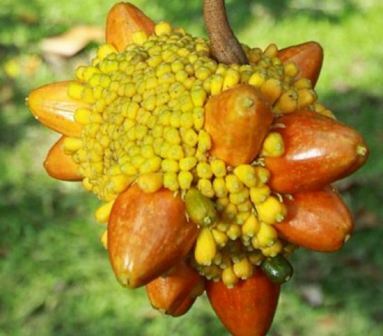 It grows in Peninsular Malaysia, Sumatra, Borneo (Sarawak, Sabah, East-Kalimantan), Moluccas, New Guinea. 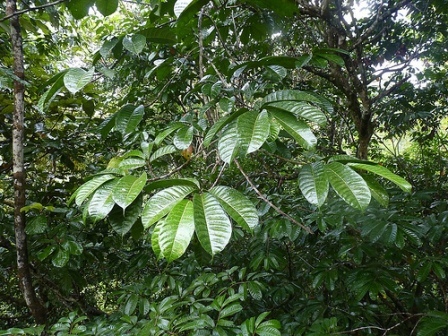 It grows wild in mixed dipterocarp forests upto 300 m occurring mostly on hill sides. 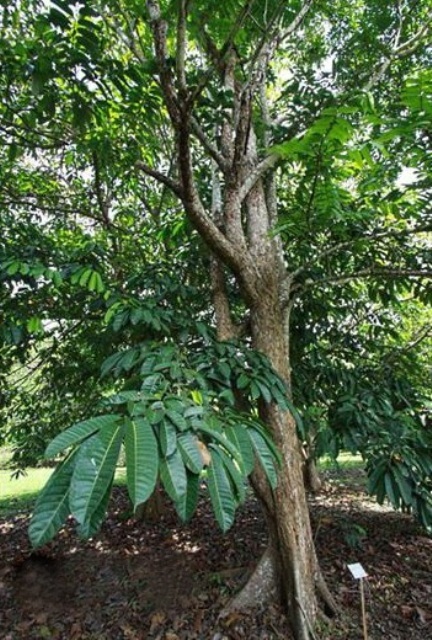 An evergreen, dioecious canopy tree upto 30 m high, 60 cm girth with grey brown bole, cracking to scaly, and crown width 3.0 to 5.8 m; inner bark is orange with white latex. Leaves alternate, simple glabrous to hairy below on 10-15 mm petioles; lamina oblong elliptic, obovate elliptic or elliptic, 10-13 cm by 4-13 cm, base cuneate, to rounded, apex mucronulate, penni-veined, 12-14 pairs of lateral leaves, distinct below on 8-22 mm long petioles. Inlorescence unisexual, capitate, heads globbose to sub-globose, solitary or paired in leaf axils, flowers mixed with numerous pelateclavate or spathulate interfloral bracts, peranth free enclosing a single stamen or oavay; male head 15 cm across, globose, periant tubular, 1.4 mm long, perforate with 1.8 mm long stamen and bracts 0.3 mm peltate and ciliate on 3-4 mm long peduncle; mature female head 3.5 to 4.5 cm across, globose, loosely covered by numerous flowers and and yellow green spathulate. Ciliate bracts and fruiting peranths on long, puburulent peduncle 7.5-254 cm. Fruiting perianths, 8-20, ellipsoid 1.5×1.0 cm, prude out of globose head, amongst the mass of unfertilized greenish-yellow flowers imparting an unusal peculiar and uniquqe irregularly radiating stellate mass, remainng unfrtilized prianths 4 mm long, with clavate apices and pubescent; fruiting peranth green, turning yellow turning yellow to bright orangey yello when ripe. Seed large, attached laterally near the base of fruiting perianth. The fruits are edible. They taste a pleasant blend of sweet and tart. 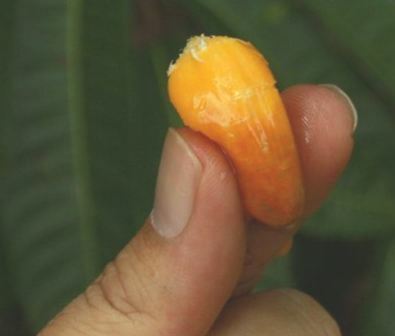 The seeds are eaten in Papua and New Guinea. Limpato has not been brought under cultivation. The fruits are collected from the wild only.